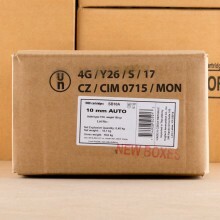 BULK 10mm AMMO SHIPS FREE AT AMMOMAN.COM! 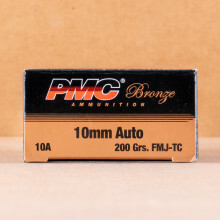 Introduced in the early 1980's, 10mm ammo was originally designed for use with the Bren-Ten pistol. 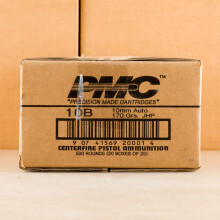 A power-charged caliber, 10mm rounds typically travel between 1,300 and 1,600 feet per second from the pistol barrel. 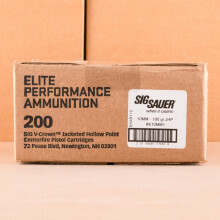 The 10mm caliber was used briefly by the Federal Bureau of Investigation but discontinued after their firearms training unit determined the recoil of the caliber to be excessively strong. 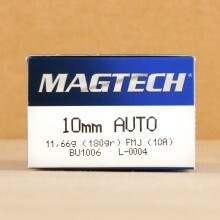 Still, many shooters enjoy the 10mm's strength today as a self-defense caliber in the United States. 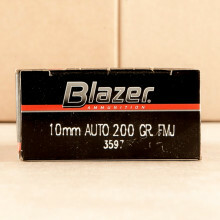 Designed in part by a name well-known to many gun owners in the United States, Jeff Cooper, the 10mm cartridge was born out of necessity for a larger caliber. 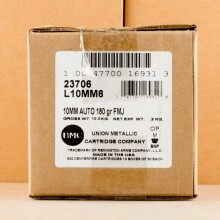 Today, you might also hear the 10mm described as 10mm Auto, both terms refer to the same ammunition. 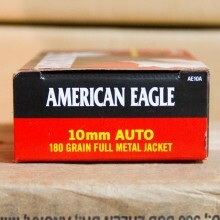 Today, 10mm ammo is not nearly as popular as it was in the late 1980s and early 1990s. In part, that popularity was brought on because of the round’s prominence in the hit television show “Miami Vice”. 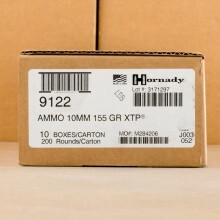 However, soon after its introduction, many shooters quickly switched to the 40 Smith and Wesson cartridge because 10mm was simply too large and too powerful to handle. 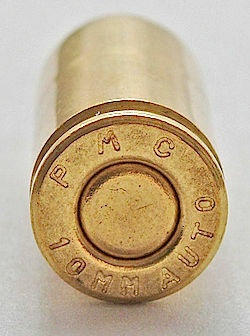 You’ll find 10mm shooters with bullet weights ranging from the very light 135 grain to the heavier 200 grain projectile. 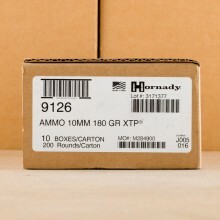 Muzzle velocities for these rounds are about 1,600 feet per second for the lighter bullets and 1,300 feet per second for the 200 grain round. 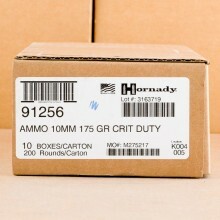 In terms of muzzle energy, 10mm is a hefty caliber with generally between 700 and 800 foot pounds of muzzle energy. 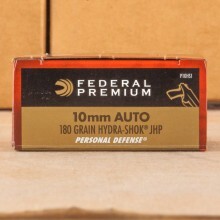 If you’re looking for 10mm training ammo, be sure to look for full metal jacket (FMJ) ammunition. These rounds are also commonly called “ball ammo” because the bullets are not designed to expand upon impact. 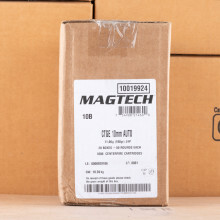 You might also find flat point rounds that are ballistically designed to be similar to ball ammunition, meaning they are also good for training purposes. For self-defense, seek out jacketed hollow point (JHP) bullets. These projectiles are much more sophisticated and designed to expand when making contact with a soft target. This expansion creates a large wound channel and delivers the maximum amount of energy to your target.